The combination of new technologies, IT infrastructures and data analytics holds out an alluring possibility of a world in which the end-to-end supply chain is utterly transformed – highly connected, flexible, efficient, resilient and truly responsive to customer needs. Each of those attributes sounds attractively incremental but put them together and you have a completely new way of doing business and one in which customers are not just on the receiving end of a product or service but are central to it. A good example of this – and one that we know well – is the pharmaceutical sector. As part of the REMEDIES project, we are working with the major players in the UK pharmaceutical supply chain to address some of the challenges they face, such as tackling the hundreds of days’ of inventory sitting in the supply chain and the vast quantities of waste caused by patients not taking the drugs they are prescribed. Using digital technologies and data-rich systems to make the pharmaceutical supply chain much more efficient is one thing but we are also mapping an entirely new business model in which drugs can be manufactured to order – possibly at the local pharmacy – to meet a patient’s individual medical needs, and where the consumption and effects of those drugs can be continuously monitored to help doctors better support their patients. A brave new world, in other words, of personalised medicine enabled by digital manufacturing processes, digital infrastructures and lots of data. But realising this vision of a digital future remains elusive, particularly for the largest global businesses. Many of these companies recognise the need to digitalise aspects of their supply chain, often in response to particular challenges. They may, for example, as in the pharmaceutical sector, have a pressing need to solve the intransigent inventory management issues that bedevil many supply chains. They may have an issue with quality and see digitalisation as the best way to ensure their products are of a consistently high quality and their provenance is traceable. Or they may be losing competitive advantage through poor customer service and see a digital agenda as a way of regaining market share, possibly while supporting their ambitions to reduce environmental impact. But developing an end-to-end digital supply chain involves a major transformation both at a conceptual level and in execution. And while thought leaders and change agents within big companies may see the prize, CEOs and shareholders will be much more cautious given the levels of investment and organisation-wide disruption it entails. This is particularly the case for the global giants with a history of merger and acquisition and an array of legacy systems to integrate. Even without the complication of M&A, all large companies have to organise themselves into manageable structures, which have a natural tendency to turn into silos and hence become obstacles to organisational change. There is also the wider question of a lack of digital skills and attitudes across the board – at senior and middle management levels as well as within day-to-day factory operations. Companies may be able to see the opportunity, acquire the technology and capture the data but a shortage of both skills and mindset presents a significant barrier. One of the challenges with the digital supply chain vision is the sheer scale and ambition of it. At CIM we have begun to conceptualise what a digital supply chain might look like and break it down into ten key areas or ‘scenarios’ (see opposite) to help companies understand the key ways in which digitalisation can impact on their organisation. We have been doing this by talking to companies both individually and as a non-competitive group. Having identified ten key areas we have been developing ‘maturity models’ against which companies can benchmark their current performance, identify where the greatest opportunities lie and start to think about where to prioritise their efforts. 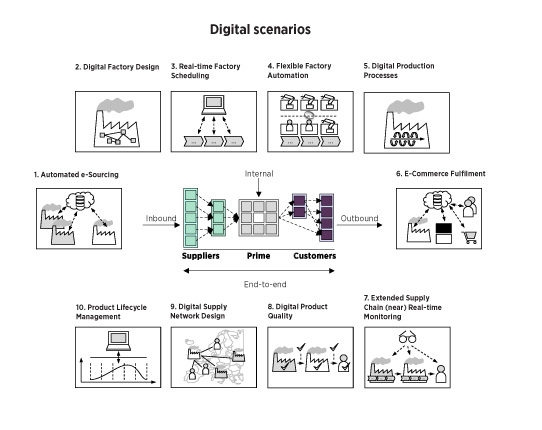 The ten scenarios include factory design and production processes as digital developments in these areas underpin the extended supply chain. The flexible factory is an important concept in this rapidly moving environment: how can you design and configure a factory for technologies which you don’t yet know. In this context, factories need to be modular and reconfigurable. One of the questions our framework helps companies consider is this: it is relatively straightforward to design a state-of-the-art, highly flexible plug-and-play factory – but is it cost-effective? Is it where companies will be able to create and capture most value? Some companies are already very good at gathering product and customer data but the challenge is how to integrate that data and use it to make better decisions about, for example, product lifecycle management, sales forecasting and designing products and services in response to customer needs. Data ownership is fast becoming an important issue in the supply chain and service delivery context. When partners are involved who owns and can access the data is a critical question. Data sharing and connectivity also raises the question of open source versus ‘black box’ and developing common international data standards across sectors. In this area we must also consider the resilience of these digital supply chains and understand the cyber security challenges they may present. One of the conceptual and practical challenges for organisations is whether to build monolithic, enterprise-wide systems that can connect supply chains. Clearly, for many companies – particularly those with a history of M&A – it would require a huge act of organisational will, not to mention significant investment, in order to move to a common platform. And, would doing so actually deliver a sufficiently flexible and reconfigurable solution? Instead, companies are talking about developing a ‘digital backbone’ which can interface with other systems to provide more networked and flexible approaches to optimising the end-to-end supply chain. And this digital backbone is more than an IT system – it should embody the critical touch points and interfaces between organisations as well as the data architectures and analytics. It also signifies a cultural shift to digital. Using web-based systems to fulfil orders and manage the complexity of last-mile logistics is something that we have seen business-to-consumer companies do with impressive levels of sophistication and achieve corresponding levels of competitive advantage. For many large manufacturers there is still work to be done in developing systems which can support product delivery to multiple points of sale and ultimately direct to the end customer. But the opportunities are clear and create a virtuous circle. By delivering better customer service you not only attract new customers (and retain the old ones) but you also get access to better customer data which in turn can improve both the product and the service you offer. There are also many efficiencies to be had from digitalising this last leg of the supply chain though better stock management and reduced transport costs. By breaking down the digital supply chain into ten distinct but connected scenarios against which companies can measure their performance and aspirations, we believe we have created a powerful framework which will help them develop their digital supply chain capabilities. The ten scenarios help to clarify thinking and develop a strategic approach to digitalisation which is both deliverable and will create maximum value for the company. The next step is to put the strategy into action.